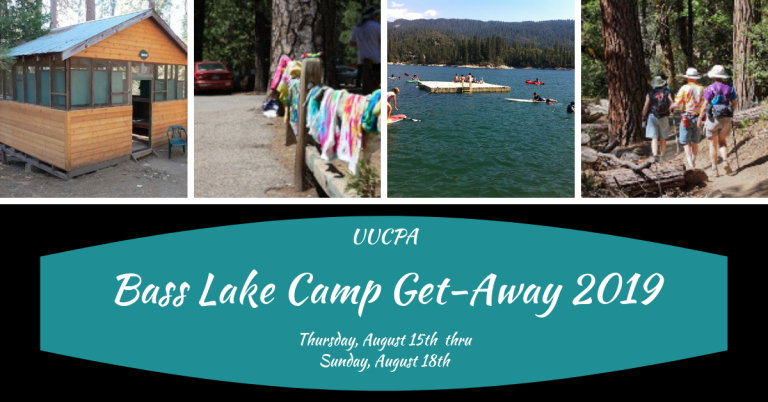 The UUCPA Bass Lake Camp Get-Away 2019 registration is now open. Join your friends at a beautiful mountain camp with its own private beach from Thursday, August 15th – Sunday, August 18th. The long weekend will feature swimming and boating, horseback rides, hiking and relaxing and is open to UUCPA members, other UU members and their friends. Meals and rustic cabins are provided and there are no meetings or chores. Space is limited in 2019 to 19 cabins so register before February 28th to reserve your cabin and get your early bird discount. Visit the web page for more information and registration details.